Flow cytometric analysis of HeLa cells using Numb (C29G11) Rabbit mAb (PE Conjugate) (solid line) compared to concentration-matched Rabbit (DA1E) mAb IgG XP® Isotype Control (PE Conjugate) #5742 (dashed line). 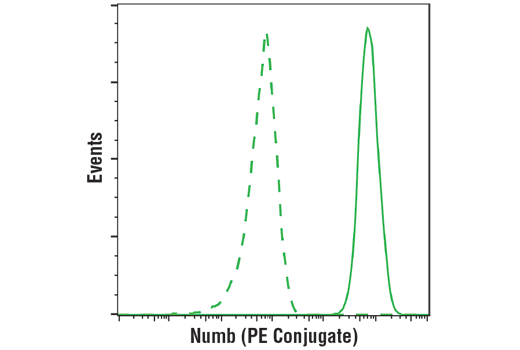 Numb (C29G11) Rabbit mAb (PE Conjugate) detects endogenous levels of total Numb protein. Monoclonal antibody is produced by immunizing animals with a synthetic peptide corresponding to residues surrounding Ala570 of human Numb protein. This Cell Signaling Technology antibody is conjugated to phycoerythrin (PE) and tested in-house for direct flow cytometric analysis in human cells. This antibody is expected to exhibit the same species cross-reactivity as the unconjugated Numb (C29G11) Rabbit mAb #2756. Numb contains an amino-terminal phosphotyrosine-binding (PTB) domain and carboxy-terminal endocytic binding motifs for α-adaptin and EH (Eps15 homology) domain-containing proteins, indicating a role in endocytosis (1,2). There are four mammalian Numb splicing isoforms that are differentially expressed and may have distinct functions (3-5). Numb acts as a negative regulator of Notch signaling by promoting ubiquitination and degradation of Notch (6). The protein is asymmetrically segregated into one daughter cell during cell division, producing two daughter cells with different responses to Notch signaling and different cell fates (7,8). The localization of Numb can also be regulated by G-protein coupled receptor (GPCR) and PKC signaling (9). Berdnik, D. et al. (2002) Dev. Cell 3, 221-231. Santolini, E. et al. (2000) J. Cell Biol. 151, 1345-1352. Dho, S.E. et al. (1999) J. Biol. Chem. 274, 33097-33104. Verdi, J.M. et al. (1999) Proc. Natl. Acad. Sci. USA 96, 10472-10476. Toriya, M. et al. (2006) Dev. Neurosci. 28, 142-155. McGill, M.A. and McGlade, C.J. (2003) J. Biol. Chem. 278, 23196-23203. Verdi, J.M. et al. (1996) Curr. Biol. 6, 1134-1145. Reugels, A.M. et al. (2006) Dev. Dyn. 235, 934-948. Dho, S.E. et al. (2006) Mol. Biol. Cell 17, 4142-4155.